“Yes, we get it, the mainstream news isn’t covering Bernie Sanders enough, Ok, moving on,” Bill Maher quipped at journalist Amy Goodman on his show Real Time a couple weeks ago. I was floored. Here was one of the left’s biggest allies, co-founder of Democracy Now!, a long-running news program a fighter of the good fight, specifically brought on to the show for her liberal point of view regarding democracy, and she was basically told to “shut up” by Maher, a supposed liberal and Bernie-supporter himself. Needless to say, I had a tough time swallowing the rest of the show, and Goodman herself barely made a peep for the duration of the program after that. Merely a few days later, Rachel Maddow decided to rant about how fantastical (“Not to be confused with fantastic,” she said) a Bernie primary win would be, saying his assertion that a contested convention would never happen in reality. If you’re a Bernie supporter, you’ve most likely done the math a dozen times yourself and know that she’s wrong. What’s worse, Maddow compared Obama’s 4% lead at the end of the 2008 primary to Hillary’s current 11% lead and used that obviously wrong comparison (the race isn’t over) to somehow prove that Sanders has no chance. That’s when I realized this wasn’t a liberal issue at all but a class issue. Rachel Maddow’s rumored annual salary from MSNBC is $7 million dollars a year. Bill Maher’s rumored net worth is around $30 million, so his HBO salary is most likely around the same as Maddow’s. With all that money, you’d think they wouldn’t need to worry about their financial future, but the fact is most rich people only want more. So, for a guy like Bernie Sanders to come along and tell them their taxes are going to skyrocket (to about 45% in federal taxes alone for people in their income bracket), it makes sense that they, too, would not be psyched about him becoming president. Another liberal talking head, The Daily Show’s Trevor Noah, generally stays away from the real issues in his monologues altogether, instead focusing on what the mainstream media is saying is an issue (like Donald Trump, Donald Trump, Donald Trump) and only gives a fraction of his time to Bernie. And with Jon Stewart virtually non-existent, it begs the question…. 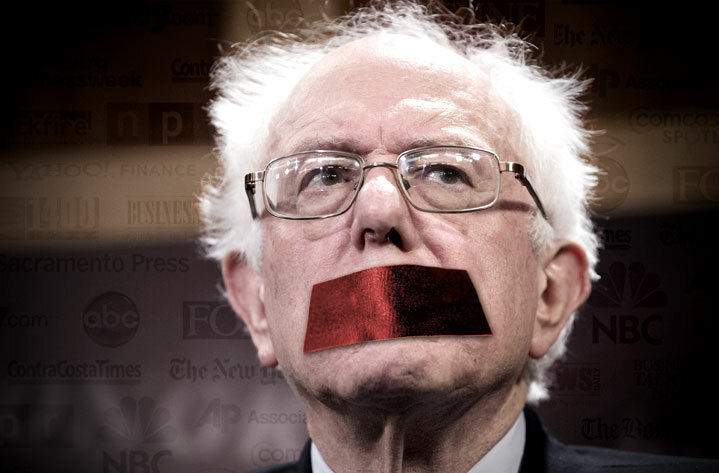 is ANYONE in the mainstream media on Bernie’s side? That’s why it’s absolutely crucial, for the good of the American psyche, for all of us to turn off the mainstream media and tune-in to smaller media groups like RT America, The Young Turks, Democracy Now! and others. If there’s one thing I learned about business in my 40 years on the Earth, it’s that boycotting works. If you are running a business and nobody wants to buy your product, you don’t have a business. The problem is that America has an addiction to the mainstream. We were brought up on it and it’s embedded into our technology, especially our phones. If you don’t like Google, for example, you can’t escape it. And it’s so convenient to get your news from Google News, why use an alternative? At least that’s what so many of us think. What’s even worse is that the amount of money and resources the media conglomerates have makes it easy for them to cover stories that the smaller groups can’t. But this is even more of a reason for people to become the media and produce their own investigative reports. If you have a degree in journalism but can’t get a job as a journalist, then you should be blogging. It’s a disservice to us all if you aren’t. With enough independent media groups working together, we can overcome our addiction to the mainstream and force them to change with the tide. And that tide is just starting to come in….